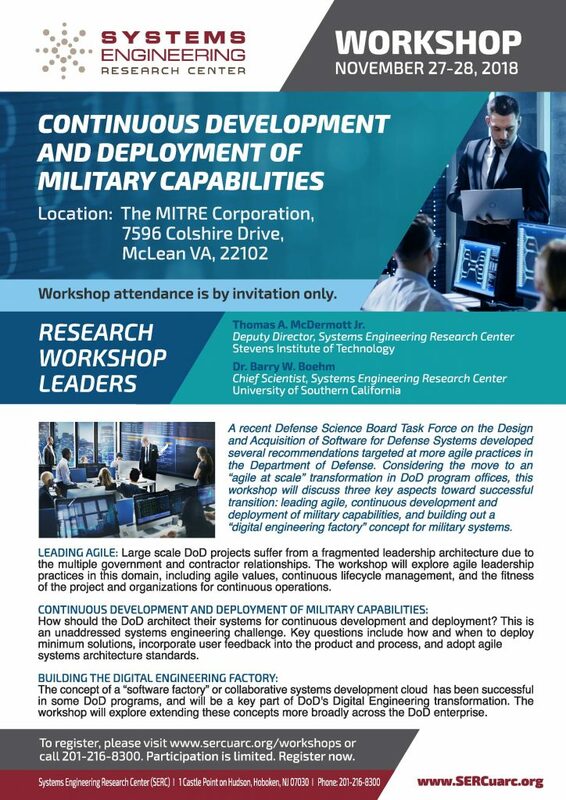 The SERC is hosting a Workshop on “Continuous Development and Deployment of Military Capabilities” from November 27-28, 2018 in McLean, VA. Workshop attendance is by invitation only, with attendance limited to 75 delegates. A recent Defense Science Board Task Force on the Design and Acquisition of Software for Defense Systems developed several recommendations targeted at more agile practices in the Department of Defense. Considering the move to an “agile at scale” transformation in DoD program offices, this workshop will discuss three key aspects toward successful transition: leading agile, continuous development and deployment of military capabilities, and building out a “digital engineering factory” concept for military systems. LEADING AGILE: Large scale DoD projects suffer from a fragmented leadership architecture due to the multiple government and contractor relationships. The workshop will explore agile leadership practices in this domain, including agile values, continuous lifecycle management, and the fitness of the project and organizations for continuous operations. CONTINUOUS DEVELOPMENT AND DEPLOYMENT OF MILITARY CAPABILITIES: How should the DoD architect their systems for continuous development and deployment? This is an unaddressed systems engineering challenge. Key questions include how and when to deploy minimum solutions, incorporate user feedback into the product and process, and adopt agile systems architecture standards. BUILDING THE DIGITAL ENGINEERING FACTORY: The concept of a “software factory” or collaborative systems development cloud has been successful in some DoD programs, and will be a key part of DoD’s Digital Engineering transformation. The workshop will explore extending these concepts more broadly across the DoD enterprise. Reminder – this event is by invitation only. Participation is limited. If you are interested in joining, please contact Tom McDermott no later than November 19. Hugger, Craig P CTR (US) and I have been directed to participate in the SERC workshop November 27 – November 28 for DASD(DT&E). Request you send me an invite and VAR information so we can prepare for the meeting. If you have read aheads, I’d like to review them.